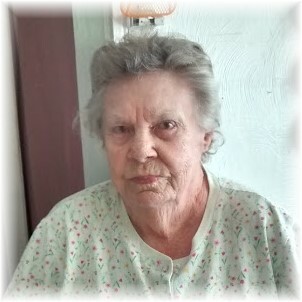 Obituary for Florence Daniels | Thompson-Marodi Funeral Home, Inc.
She was born August 17, 1927 in Washington, a daughter of the late Thomas Cox and Cinda Horner Cox. Surviving are her children, Robin Daniels of West Alexander, Cindy Williams of North Carolina, David Daniels, Jr. of Bentleyville, Starr Guthrie (Roger) of Carmichaels, Betsy Jo Sebetich of Washington and Christy Minton of Albuquerque, New Mexico; several grandchildren, great-grandchildren and many friends. Deceased are her husband, David James Daniels, Sr.; four children, Cheryl Lynn, Petey, Joel Paul and Sammy; three brothers and one sister. As per Mrs. Daniel’s request, there will be no visitation or service. Memorial contributions may be made to Washington Area Humane Society, PO Box 66, Eighty Four, PA 15330. Other arrangements in care of Thompson-Marodi Funeral Home, Bentleyville, 724-239-2255. Visit www.thompson-marodi.com to leave a condolence message.